Bellator has officially won the race to Hawaii as their first event in the aloha state will take place on December 15 for Bellator 210. There was only one choice for a headliner when it came to the event and that was Bellator’s biggest Hawaiian star and just one of their biggest stars in general, their flyweight champion “The Ilimanator” Ilima-Lei Macfarlane. Standing across from her to try and spoil the homecoming will be Canada’s “Trouble”, the one-time UFC strawweight title challenger Valerie Letourneau. As the historic event was just recently announced this past week, Bellator has already gotten their promotion off and running in very proper fashion for the media tour as Macfarlane has gone around to a University of Hawaii volleyball game, a Punahou high school football game (which is where she attended high school), as well as a day on set of Hawaii Five-O. But now Macfarlane has gotten her own day! 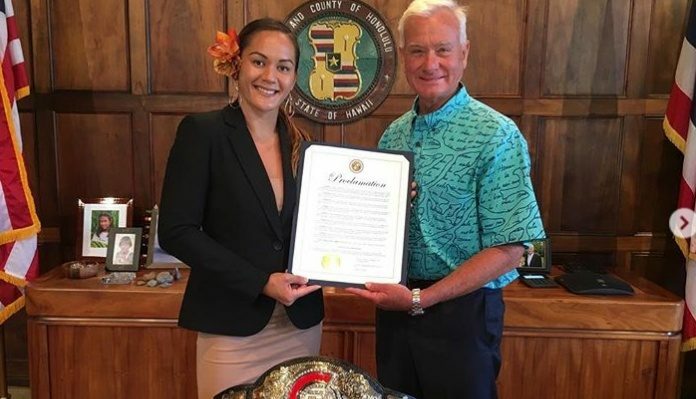 Mayor of Honolulu Kirk Caldwell made the proclamation yesterday that September 17 is now Ilima-Lei Macfarlane Day. Congratulations to @ilimanator for being crowned the #BellatorMMA Female Flyweight World Champion! In your honor, this day, September 17, 2018, is proclaimed Ilima-Lei Macfarlane Day! On behalf of our whole city, we’re proud of you and all of your accomplishments, and we’re excited to see the future ahead of you. Good luck on the big fight in December! “The Pineapple Princess” has been a reflection of perfection so far throughout her MMA career and as a role model to her state. Macfarlane holds an impressive undefeated record of 8-0 (five submissions, one knockout) and has established herself as one of the very best flyweights in the world today. The atmosphere for an event in Hawaii alone was already going to be big enough to make it the biggest fight of her still young career to date but adding in the opponent of the experienced Letourneau just makes it even that much more of a challenge. Something that Macfarlane will happily tackle.